Gives a streak-free shine with plant-derived cleaning agents. Nontoxic formula is safe on glass, mirrors, stainless steel and other surfaces; but most importantly the fingers and faces pressed up against them. Breathe easy -- does not create harsh fumes. Free & Clear of dyes and fragrances. Scent-free and a natural choice for those sensitive to scents. Application: Kitchens; Bathrooms; Hard Surfaces; Applicable Material: Glass; Stainless Steel; Chrome; Windows; Mirrors; Hard Surfaces; Chemical Compound: Natural Ingredients; Plant-Derived Surfactants; Dirt Types: Dirt; Fingerprints; Grease. Made from all natural, plant-derived ingredients; All ingredients are disclosed; Non-toxic, biodegradable and hypo-allergenic; Does not create harsh fumes; Free of chlorine, acids, phosphates, VOCs, dyes, petroleum-based ingredients and artificial fragrances; Not tested on animals. 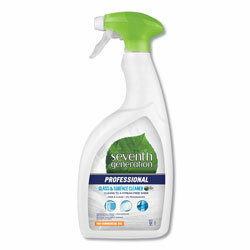 Glass Cleaners from Seventh Generation! 228 In Stock today.